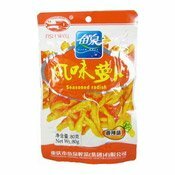 The product has special flavour and tastes crisp, spicy-hot and delicious. It tastes very good and increase your appetite. It can be eaten directly upon opening the bag. Ingredients: Turnip, Salt, Rapeseed Oil, Sugar, Chilli, Spices (Aniseed, Fennel, Dried Ginger, Licorice, Pepper), Flavour Enhancer (E621), Acidity Regulator (E330). Simply enter your details below and we will send you an e-mail when “Seasoned Radish (魚泉風味蘿蔔)” is back in stock!